Ms. Dashiff's 12th grade Honors Biology class took a trip to the Harlem branch of the Cold Spring Harbor Laboratory to perform an experiment on harmless E. coli to test their resistance to antibiotic ampicillin through exposure to the ampicillin-resistant plasmid pGFP. 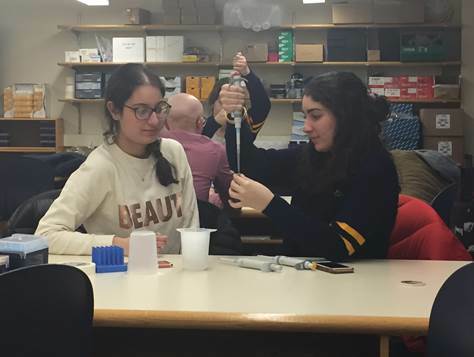 The students had the chance to work with sophisticated lab equipment, including pipets that measured exactly the amount geared into them, such as a precise 10 micromilliliters. The students received four petri dishes: one was the control which left the bacteria, one exposed the bacteria to pGFP and ampicillin, one just exposed the bacteria to pGFP, and one just exposed it to ampicillin. The dishes exposed to pGFP or to nothing at all stayed the same; the bacteria dish only exposed to ampicillin all died, and the bacteria exposed to both pGFP and ampicillin were able to colonize and multiply. Overall, it was informative to see what it was like to work for an extended period in a lab and to apply principles learned in class to an experiment with a widely known substance like E. Coli.